Nicaragua is the second-poorest economy in Latin America after Haiti, and has already lost much of its forest cover to agricultural development. About 21 percent of the country’s forests disappeared between 1990 and 2005. The silver lining is that the government now legally recognizes 49 percent of the remaining forests as community-owned forests, more than other Latin American countries like Honduras, Guatemala, Brazil, and Bolivia. Community forests are important not only for preserving indigenous livelihoods, but for protecting biodiversity and curbing climate change. Recent research from WRI and the Rights and Resources Initiative found that legally recognized and protected community forests have lower rates of deforestation than forests where community rights are insecure. The world’s 513 million hectares of legally recognized community forest store 37 billion tonnes of carbon—29 times the annual carbon footprint of all passenger vehicles. But Nicaragua’s government was slow to protect communities’ rights to forests. Indeed, it was indigenous communities themselves who stepped up and conserved their forests in the face of government inaction. Established in 1991, the Bosawas Biosphere Reserve in Nicaragua in north-central Nicaragua, together with the Rio Platano Reserve in Honduras and adjacent protected areas, is one of the largest areas of protected tropical forest in Central America. The core area and buffer zone of Bosawas covers 854,000 hectares, or about 7 percent of Nicaragua. Large parts of the reserve and remaining tropical forests are inhabited by indigenous groups like the Mayangna (Sumo) and Miskito Indians. These indigenous peoples subsist on the reserve’s natural resources, employing sustainable practices to conserve ecosystems. Farming is based on shifting agriculture, with the land cropped for a year and then allowed to revert to forest. Few families have cattle, although they do keep other animals such as pigs. The Mayangna and Miskitu attempted to get the government to legally recognize their lands in the 1990s. After this attempt failed, thousands of colonists encroached on the communities’ forests—encroachments that continue to this day. Colonists’ livelihood strategy is very different from the indigenous Indians. They typically keep more cattle, removing forest cover to develop as much pasture as possible. They then sell the “improved” land to the next wave of colonists before moving deeper into the forest. The Nicaraguan Ministry of Environment and Natural Resources (MARENA) is responsible for limiting encroachment on the reserve, but their efforts to restrict colonists’ incursions have been weak, as colonists have more political backing than Indigenous Peoples. So Nicaragua’s forest communities took matters into their own hands. After the initial encroachments, the Mayangna organized themselves into associations along ethnic and traditional territorial lines. They mapped the boundaries of their lands and worked to resolve disputes with neighboring colonists. By the late 1990s, although not officially recognized by the government, the associations demarcated boundaries of their lands, with indigenous forest rangers patrolling the borders. These local efforts to conserve community forests were undermined by government authorization of logging on the Mayangna’s traditional lands. The leaders of indigenous communities first appealed to government officials and the Nicaraguan judicial system to protest the lack of prior consultation. When their protests did not generate any positive responses, they took their case to the Organization of American States (OAS). In 2001, the Inter-American Court of Human Rights found that Nicaragua had violated the rights of the community by granting logging concessions on their traditional lands and failing to recognize the property rights of the indigenous communities. Despite government delays and resistance to formally recognize these indigenous claims, the sustained grassroots pressures from forest communities, along with the court decision and support from the OAS and other groups, ultimately succeeded in prompting the government to adopt new land laws in 2002. By 2005, the Nicaraguan government made further progress in awarding common property titles to the Mayangna. These titles provide legal recognition of indigenous communities’ rights to communal forest lands and associated natural resources. 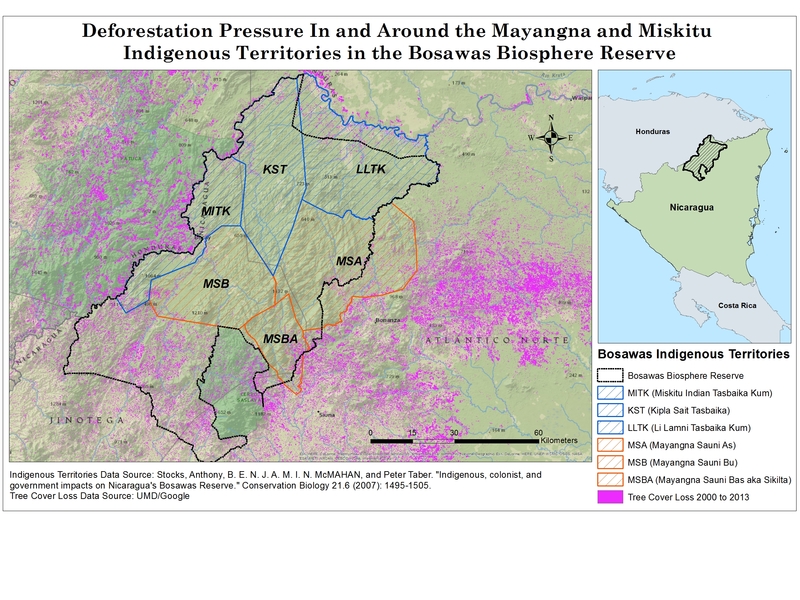 A comparison of forest cover loss within and outside of the Mayangna’s recognized territories reveals that their commitment to protect forests has been effective. Deforestation rates are 14 times higher in settler-occupied lands adjacent to the Mayangna territories. The story is not over, of course. Colonists continue to settle in community forests to this day, and government agencies continue to look the other way. But with legal recognition, Indigenous Peoples have more ownership over the forests they call home. By defending their homeland and legally establishing customary ownership of their forests, Nicaragua’s Indigenous Peoples can provide a strong bulwark against deforestation and climate change.